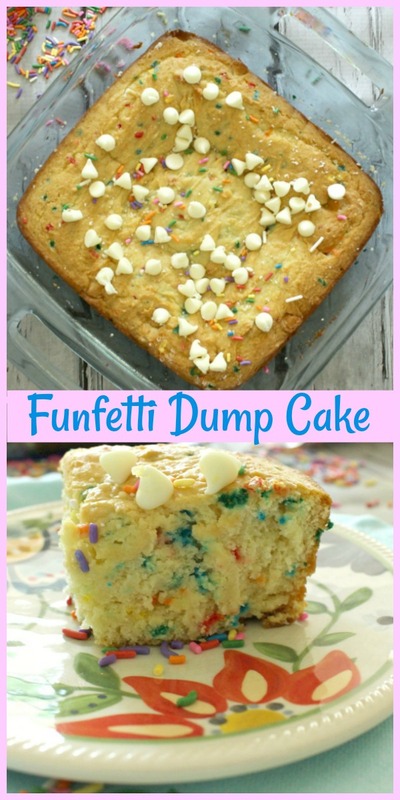 Funfetti Dump Cake – Funfetti Fun! 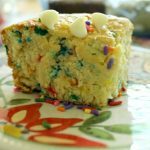 This simple cake recipe is fun to make with the kids and everyone is going to love it. Take a big bite and enjoy! 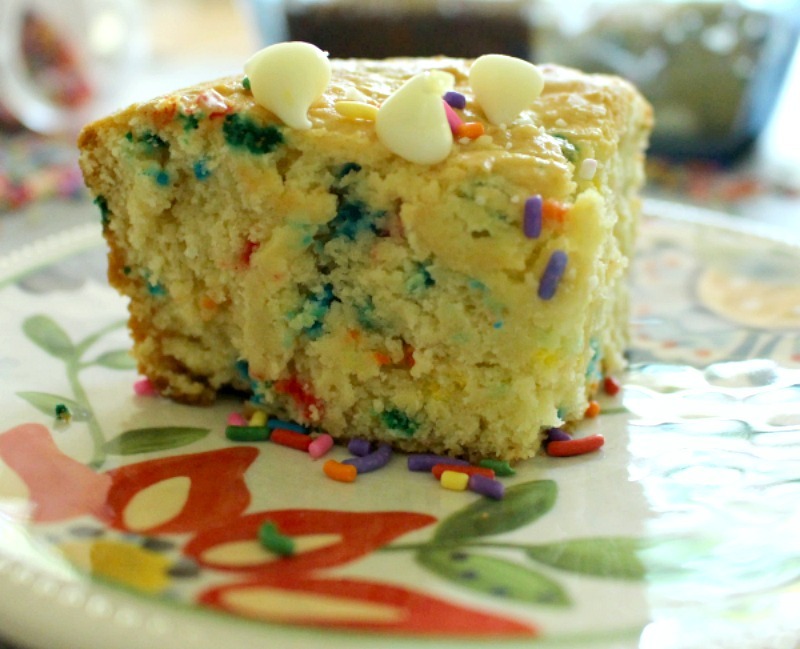 You will love how easy-peasy this cake is to prepared. 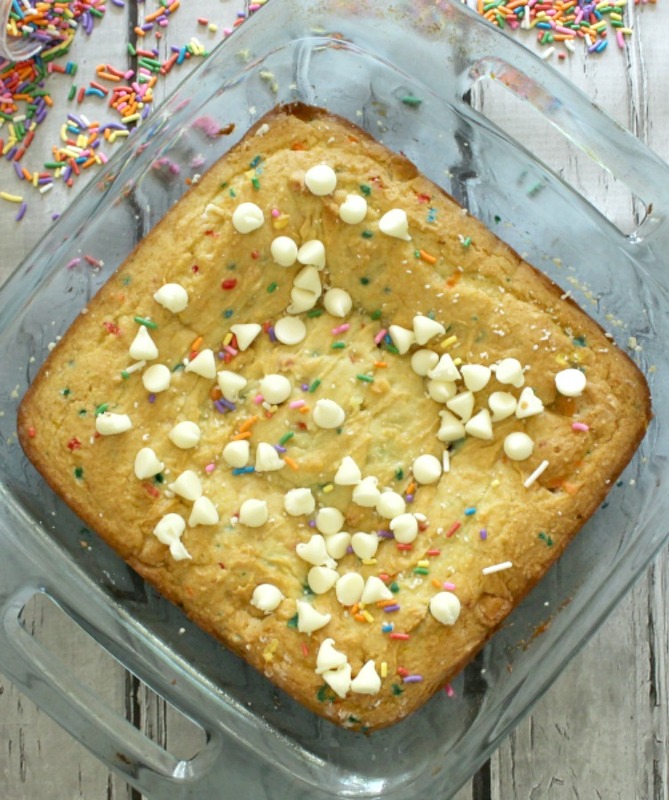 There’s no egg so have the kids help out making this yummy, fun cake recipe. With just a few ingredients, you have a moist, sweet cake that’s sure to become a family and company favorite. If you are in the mood something chocolate, check out this Triple Chocolate Dump Cake. It’s also so easy to prepare and oh so chocolate delicious. Preheat oven to 350 degrees, spray a 9 x 9 baking pan with cooking spray and set aside. In a large mixing bowl, toss in dry cake mix, dry pudding mix and whisk until all clumps are gone. Add vanilla extract into milk and pour into bowl. With a large wire whisk, mix until completely combined. Toss in chips and sprinkles. Save some for topping. Spread evenly into prepared pan and bake for about 30 to 35 minutes until lightly browned. When you touch the cake lightly it should slightly spring back and then check with a toothpick. 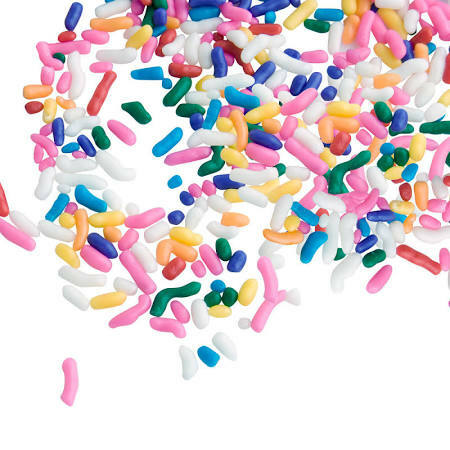 Sprinkle the remaining chips with a sprinkles. Let cool for at least 30 minutes. Funfetti Fun! This simple cake recipe is fun to make with the kids and everyone is going to love it. Take a big bite and enjoy! 1.Preheat oven to 350 degrees, spray a 9 x 9 baking pan with cooking spray and set aside. 2.In a large mixing bowl, toss in dry cake mix, dry pudding mix and whisk until all clumps are gone. Add vanilla extract into milk and pour into bowl. With a large wire whisk, mix until completely combined. Toss in chips and sprinkles. Save some for topping. 3.Spread evenly into prepared pan and bake for about 30 to 35 minutes until lightly browned. When you touch the cake lightly it should slightly spring back and then check with a toothpick. 4.Sprinkle the remaining chips with a sprinkles. Let cool for at least 30 minutes. Enjoy!